Unlimited fun passes are good all day for the day of purchase. Height and weight restrictions apply. Check requirements before purchasing Junior Pass. Attractions operate weather permitting. Closed-toe shoes are required for climbing wall and go-karts. $3.00 includes 24 pitches. $25 includes 30 minutes in batting cages. Experience what it's like to free-fall 100 feet, soar right above the ground and fly above the tree tops. The Skycoaster's unique concept combines skydiving and hang-gliding—opening the skies to everyone. This one-of-a-kind thrill ride experience accelerates flyers to nearly 70 mph. Must be 42" tall to ride The Skycoaster. Includes private area with upgraded furnishings, flat screen TV, 4 Bottled Waters, locker & cabana wait staff. Includes private area with upgraded furnishings, flat screen TV, 6 Bottled Waters, locker & cabana wait staff. Book your Cabana Online Now! Cabanas Do Not Include Park Admission. Limited daily quantity. Available on a first come/first serve basis online or at the park. We reserve the right to cancel Cabana reservations with no refund if not checked in by 2:30 pm on date of reservation. Cabanas are non-refundable except for days when the park is closed. Open year-round, these attractions offer fun and excitement for all ages! Buckle up and put the pedal to the metal! Hairpin turns and smooth straightaways are what this track is all about. Great for the experienced driver or the first-timer with full-sized karts for people 60" and above, rookie karts for people at least 46" and two-seat karts for a driver and passenger. Driver must be 60". Driver with passenger must have a Driver License. Passenger must be 36" and at least 3 years old. Rookie Kart Drivers must be 46" tall. No open-toed shoes allowed. Grab your friends or play against someone new! Play a round of laser tag in our two story arena. Complete with black lights, fog, and special effect lighting. Fasten your safety belts, it's going to be a bumpy ride! Nothing says fun like our indoor bumper cars. 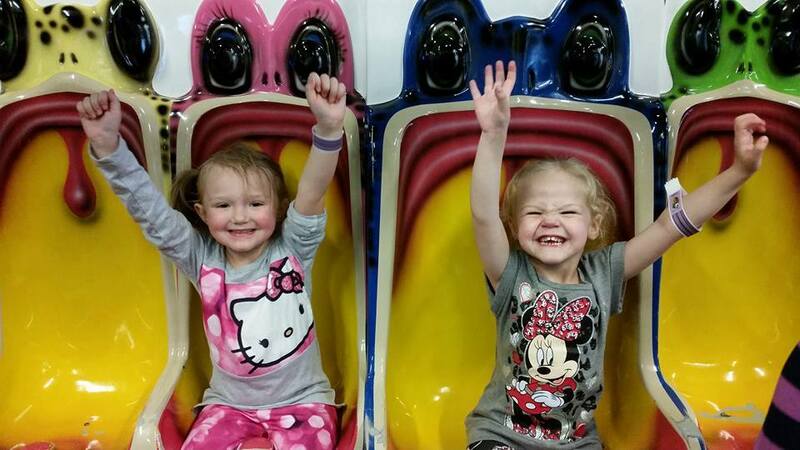 A blast for the whole bunch, our bumper cars are the great equalizer for big and small. No Sunday Drivers! Must be 44" to ride. No passengers allowed. 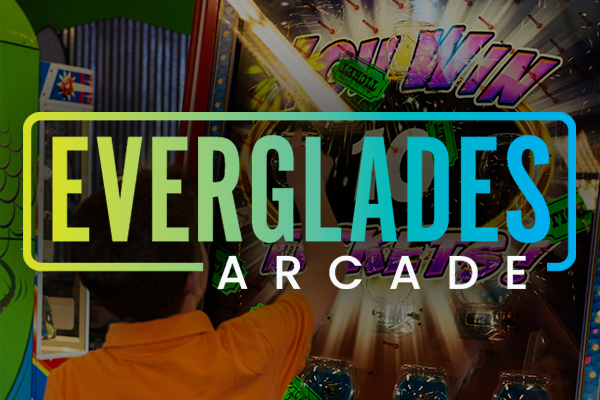 Our large arcade section features a variety of arcade games for all ages! You can play old classics like Skee-Ball and air-hockey or try the newer, more modern games. You can ski down a treacherous mountain, conquer outer space, or eliminate all competition in a fast-paced Motocross race all in one day! And when you’ve had your share of arcade adventure, you can cash in your winnings at the redemption counter and choose from many great prizes. Bring home a unique gift for a loved one or a cool new toy! Games are playable with GATOR BUCKS cards purchased at any amount you like. Outdoor Climbing Wall: Tie in and head for the top! The Rock is 32 feet of mountain climbing challenge for beginners and veterans. With up to five climbers at once and three difficulty levels, this wall is what winners are made of. Don't forget to hit the siren button when you reach the top! Indoor Climbing Wall: Indoor Climbing wall is three varying heights of climbing fun! Up to three climbers at once; each wall provides a different level of difficulty. No open-toed shoes allowed. Must be between 40 and 250 lbs. Both walls (Indoor and Outdoor) may not be operating at the same time. Romp like there's no tomorrow in the Kidz Zone! 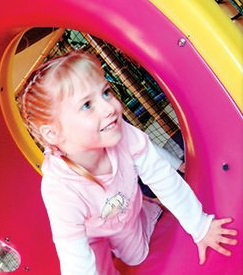 Three levels of soft-play fun and excitement including a two-story slide, climbing tunnels, and obstacles to challenge all. 48" maximum height. Socks required. Jump into a good time on the Frog Hopper. Tons of bouncing action for all ages where the law of gravity doesn't apply. Must be at least 36" to ride. Featuring more than four acres of aquatic family fun, water park attractions operate seasonally with approximately 100 operating days to cool off in the summer heat! New for 2019 - The Adventure Zone! Soak your inner adrenaline junkie on this slip-sliding, heart-pounding thrill slide that’s three stories tall! H2-Whoa! This giant inflatable obstacle course surrounded by water is unlike any other! Designed to challenge and entertain, this obstacle course features four huge red inflatable balls surrounded by a blue ball pit resembling a moat filled with water. Grab a tube and take a relaxing trip in Andy’s own Paradise River. Make your way around our 800 foot Lazy River designed to keep you cool on our hot Oklahoma summer days. It’s up to you to make it a lazy or crazy adventure on this river! 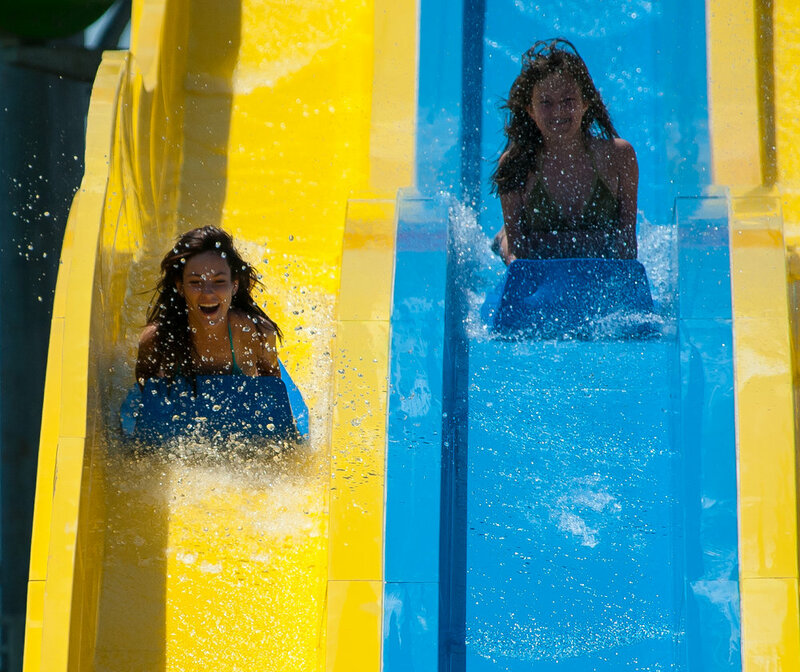 With over 100 ways to get wet, Cowabunga Cove is the ultimate play adventure! Climb to the top and pull ropes and levels to activate water features throughout the attraction. When you hear the bell ringing head to the base to get drenched by over 800 gallons of water coming out of our giant tipping bucket. Cowabunga Cove features 3 body slides for guests to enjoy. Grab a tube and climb up 45’ feet to start your decent down the Banzai Pipeline. Experience unexpected curves, drops and loops as you make your way down this huge slide! Single and double tubes are available to enjoy your experience with a friend! Challenge your friends to a drag race on our 4 lane mat racer slide towering 45’ into the air! This unique slide is the only of its kind in Oklahoma and will have you heading back up the tower to race your family again. Plunge head first down the slide and see if you can catch some air….Surfs Up!! Designed for our little gators, this splash pad style area is home to bubblers and water jets that are the perfect introduction to your little ones first water park experience. Try out our mini water slide and next thing you know your kiddos will have graduated to Cowabunga Cove! The water park is currently closed for the season. Get a Season Pass now and enjoy the Fun Park every day, plus the Water Park for the entire 2019 season! You can’t miss our 32’ Climbing Wall! Make first Left into Andy Alligator’s Fun Park - You can’t miss our 32’ Climbing Wall! How much is parking or admission? FREE! There is no fee to park or to enter Andy Alligator's Fun Park. Do you have live animals at Andy’s? We do not have any live animals such as alligators at our park. Are there requirements for your rides? There are height and weight requirements for some of our attractions. Click on the attractions link to find out which ones require this information and remember to wear closed-toe shoes. Can I bring my Gator bucks card the next time I come out? Yes, all tickets and money on your card do not expire. Do you have specials at Andy’s? Yes, Andy’s has daily specials and different promotions throughout the year. Click the specials link to see what the special of the day is. Do you have an all-day pass? Yes, we have an adult all-day fun pass (60” and above) for $28.95 and a junior wristband (under 60” but over 44”) for $23.95. 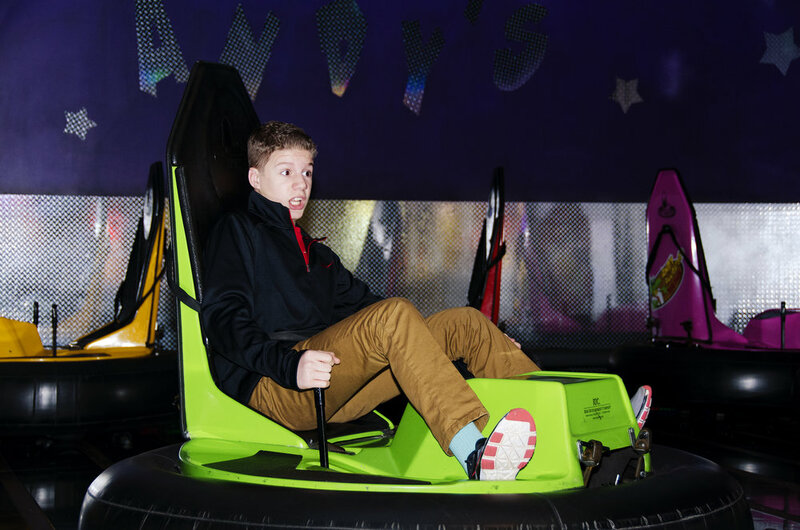 The wristbands are good all day the day of purchase and give you access to: Go-Karts, Bumper Boats, Climbing Wall, Rookie Karts, Bumper Cars, Frog Hopper, Miniature Golf & 1 round of Laser Tag. What type of attractions do you have? We have both indoor and outdoor attractions. We have: 32’ Rock Climbing Wall, 18 hole miniature Golf course, Laser Tag, Go-Karts, Batting Cages, Bumper Cars, Frog Hopper, Miniature Bowling, and Arcade Games. Are there things to do for older kids and kids at heart? Andy Alligator’s Fun Park is an all-ages park. We have something for everyone both big and small. Do you have to use tokens for your games or attractions? Andy Alligator’s Fun Park works on a game card system, but there are a few games that you will need to use tokens. You can use your game card to purchase those tokens at any token dispenser. The Gator Bucks Game Card is free and you put money on it to play the arcade games or to swipe at one of the attractions. We are open 7 days a week! Check the park info section of this website for current operating hours. Why can’t I wear flip-flops? You must wear closed-toe shoes for the Climbing Wall and for the Go-Karts due to state law and insurance safety regulations. Does the fun park offer season passes? Yes! Our Platinum Pass includes 3-Hour Fun Park Wristband every day, along with Admission to the Water Park every day, Free Bring-a-Friend Tickets, and more for just $14.99 a month. Call us at (405) 321-7275 or use the form below to send us an email. For Donation Requests please visit this link.